A new residence hall for first-year students is being planned for the south side of campus next to Collins Residence Hall, on the current site of Parking Lot H.
The design of this residence hall is based on South Hall and will look very similar, according to Dean of Residence Life and Housing Donna McGalliard. The as-yet-unnamed residence hall, projected to open early 2017, includes most of the same amenities as South Hall which opened in fall of 2010. The four-story, 220-bed building will total 75,000 square feet. It will be a double-loaded corridor style structure with a mix of single and double rooms. The residence hall will support Wake Forest’s vibrant student residential community with kitchen and study areas on each floor and amenities such as large recreation lounges where students can play games like foosball or ping pong, and media rooms, perfect for gaming tournaments or movie nights. “The media spaces have been very popular in South Hall,” McGalliard said. – Renovation of Starbucks in the Z. Smith Reynolds Library and updates in the library atrium, among others. As with other first-year residence halls, there will also be a classroom for the academic collaboration that takes place as part of the College’s Faculty Fellows Program — a partnership between the Provost’s Office and the Office of Residence Life and Housing where faculty work closely with freshmen, creating programs, hosting dinners and bringing intellectual vibrancy to the residence halls. 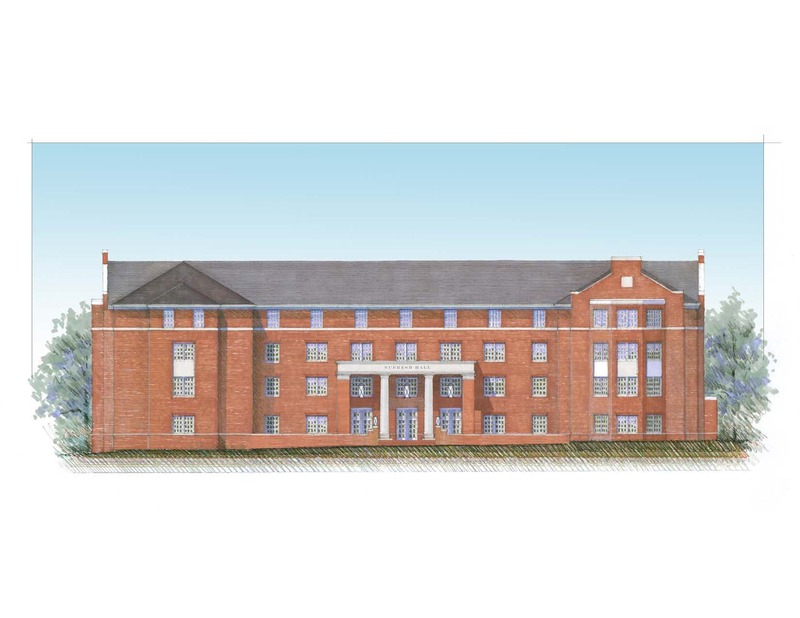 Wake Forest’s newest residence hall will be energy efficient, have the latest in green technology, and be designed to meet LEED (Leadership in Energy and Environmental Design) certification standards. Sustainable design elements will include touch screens in the hallways for monitoring energy usage, high-efficiency double-paned aluminum windows, energy-efficient kitchen and laundry appliances, and thermostats that can be adjusted in individual rooms. Wake Forest’s three-year residency requirement means campus living is connected to the academic experience and personal development. Students who live on campus are more engaged with each other, more involved in campus life, and take advantage of more opportunities for growth and learning. In August 2013, Magnolia and Dogwood residence halls opened on North Campus to provide more space for upperclass undergraduates to live on campus. Wake Forest is working with Hanbury, Evans, Wright, and Vlattas Architects and Frank L. Blum Construction on the new building. Lot H will be closed, starting July 20. It is located at the intersection of Jasper Memory Lane and Wingate Road. A portion of Lot J, next to Lot H, will be closed, also, to make room for the new residence hall.Both lots are near Collins Residence Hall. Due to the construction, access to Lot J, which is behind Collins and South Residence Halls, will be limited to a driveway just west of South Residence Hall. Access to Lot J will no longer be available from a driveway on the east side of Collins Residence Hall.